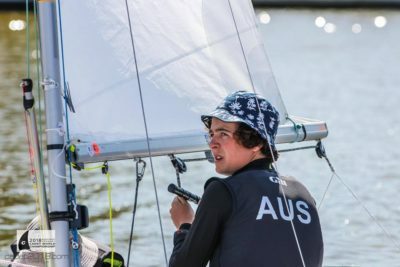 On a day of very shifty winds, the Australian team has had mixed results on day two of the International Cadet World Championships being sailed at Bodstedt, Germany. 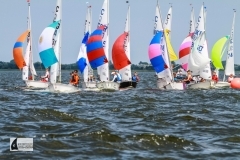 Three races were sailed overnight, with five Australian crews in the top 20 of the 63-boat fleet, two in the top six. Peter Allen and Ashton Rowstron from the Royal Yacht Club of Victoria moved up from seventh to fifth overall, sailing consistently with placings of 10-10-9. However, each of the other six Australian crews had at least one disappointing race. Jacob McConaghy and Sam Hooper from Hobart’s Sandy Bay Sailing Club dropped from fourth to sixth in standings, with a score of 19-7-40, the fifth race being their first discard. Fellow SBSC members Archer Ibbott and James Gough jumped from 22nd to 11th after five races allowed them to discard their race two penalty which placed them 45th in that race. Their day two placings were 27-14-8. Hugo Allison and Grace Hooper, the youngest Tasmanian crew, also jumped up the rankings from 35th to 14th after discarding their race two BFD (black flag). They started day two with a 33rd place, but got back amongst the leaders with a ninth and a 10th in the subsequent races. “Not the best of days today,” was brother Jack Allison’s comment after day two. “There were incredibly shifty conditions on the water with huge gains and losses to be had. “I struggled to piece together a perfect race; however, my last was very close to it, 44th, 36th and a 19th. “We have now dropped down 10 places to 30th, however it is still only early on in the regatta so heads are still high,” added Jack, who is sailing with Luca Groves as crew. Elliott Hughes and Cate McCoy from Royal Geelong Yacht Club suffered badly on day two, slipping from sixth to 17th. They started the day with a 29th place, then a 40th (discard) followed by an 18th. 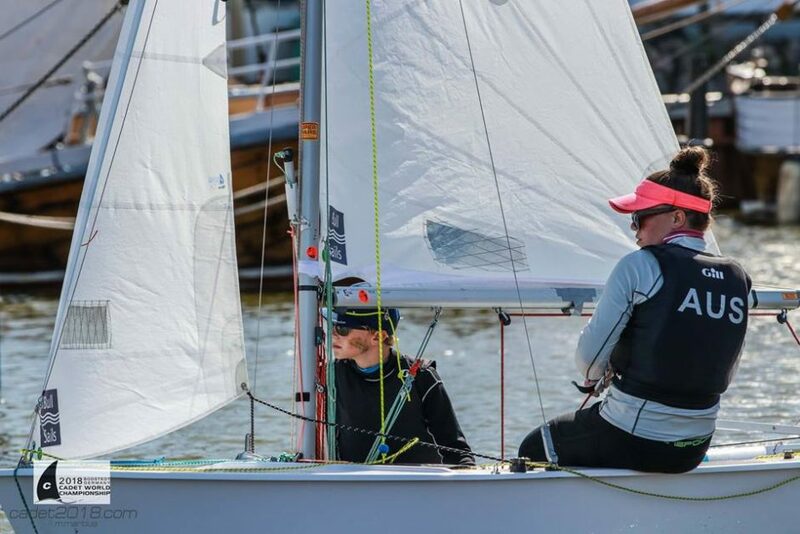 Emma Kelly and Oliver Grieve, also from RGYC also found the fickle breeze difficult to pick on day two, finishing 46th (discard) in race three and following this with a 22nd and a 20th to be 25th overall.